All Ice Shield™ Pneumatic De-icers are warranted to be free from material and workmanship defects for twenty-four (24) months, or 3,000 flight hours from the date of installation. 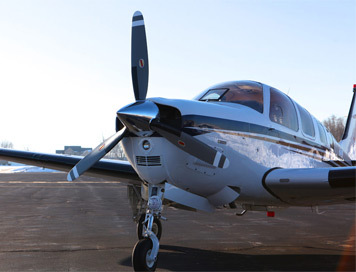 All Ice Shield™ Propeller De-icers are warranted to be free from material and workmanship defects for eighteen (18) months, or 2,000 flight hours from the date of installation. Parts are warranted to be free from material and workmanship defects for 6 months from date of installation. Parts are warranted to be free from material and workmanship defects for 1 year or 500 hours or 4 years from date of manufacture. Parts are warranted to be free from material and workmanship defects for 10 months after date of installation. Parts are warranted to be free from material and workmanship defects for 2 years from date of manufacture. Installation is warranted to be free from material and workmanship defects for 1 year from date of installation. Unless otherwise stated in Seller's proposal, Seller warrants that at the time of shipment to Buyer all Products shall conform to the applicable specifications, and for a period of one (1) year from date of installation will be free from defects in material and workmanship. The foregoing warranty only applies to Products under normal use and serviced in accordance with Seller’s installation, operating, maintenance and other written instructions. Buyer must notify Seller in writing during the warranty period of a nonconformance and, within thirty (30) calendar days of discovery of the nonconformance, Buyer must disposition the Product in accordance with Seller’s written instructions. Seller's obligation and Buyer's sole remedy under this warranty shall be limited to the repair or replacement of the nonconforming warranted Product, or any part thereof, solely at the option of the Seller. All Products repaired or replaced are warranted only for the unexpired portion of the original warranty period. Buyer will comply with Seller’s return material authorization policies and will ship Products to Seller suitably packed for shipment to prevent damage in transit in accordance with Seller’s standard shipping practices. THE WARRANTIES PROVIDED BY SELLER, AND THE REMEDIES OF BUYER, PROVIDED UNDER THIS ARTICLE, ARE EXCLUSIVE AND IN SUBSTITUTION FOR, AND BUYER HEREBY WAIVES, RELEASES AND RENOUNCES, ALL OTHER WARRANTIES, CONDITIONS, AND REPRESENTATIONS, WHETHER EXPRESS, IMPLIED, STATUTORY, WRITTEN, ORAL OR OTHERWISE, INCLUDING, BUT NOT LIMITED TO, ANY WARRANTY OF MERCHANTABILITY OR FITNESS FOR A PARTICULAR PURPOSE, AND ANY IMPLIED WARRANTY ARISING FROM ANY COURSE OF PERFORMANCE OR DEALING OR TRADE USAGE. THESE WARRANTY PROVISIONS ARE ALSO IN SUBSTITUTION OF ANY OTHER OBLIGATION, LIABILITY, RIGHT, REMEDY OR CLAIM, WHETHER IN CONTRACT OR IN TORT, INCLUDING, BUT NOT LIMITED TO, ANY RIGHT IN STRICT LIABILITY IN TORT OR ANY RIGHT ARISING FROM NEGLIGENCE, ACTUAL OR IMPUTED, ON THE PART OF SELLER. IN NO EVENT, WHETHER AS A RESULT OF BREACH OF WARRANTY OR CONTRACT OR ALLEGED NEGLIGENCE OR OTHERWISE, SHALL SELLER BE LIABLE FOR ANY INCIDENTAL, SPECIAL, CONSEQUENTIAL OR INDIRECT DAMAGES, INCLUDING, BUT NOT LIMITED TO, LOSS OF PROFITS OR REVENUES OR USE, OR ANY LIABILITY OF BUYER TO ANY THIRD PARTY, OR LOSS OF OR DAMAGE TO ANY AIRCRAFT OR PRODUCT, EVEN IF INFORMED OF THE POSSIBILITY OF SUCH DAMAGES AND NOTWITHSTANDING THE FAILURE OF THE ESSENTIAL PURPOSE OF ANY LIMITED REMEDY. NO AGREEMENT VARYING THIS WARRANTY OR THE OBLIGATIONS OF SELLER HEREUNDER WILL BE BINDING UPON SELLER UNLESS IN WRITING AND SIGNED BY A DULY AUTHORIZED REPRESENTATIVE OF SELLER.